Much better weather today with lots of sunshine. However, the temperature has markedly dropped. After some confusion over English numbers, she said €30 for last nights so called dinner but actually meant €13 with the beers. 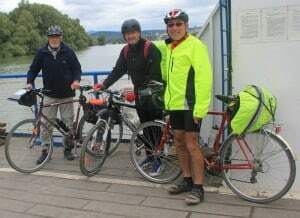 After the ferry its a gorgeous cycleway with fantastic views of the Danube as it does a major twist through the hills, be interesting to see the huge boats navigate around the S bend. On the next ferry at Vac I met another pair of Germanic guys once again one lived in Vienna but this time the other guy was from Munich not Bremen 🙂 One of them had this time, like me, cycled all the way from Donaueschingen. Alas they finish in Budapest returning next year to go to Belgrade. The hotel Centrooms House is a bit unusual been in a huge open courtyard on the first floor. It was OK, apart from the hum of some huge fan till 2am but it was very cheap & in the centre of bar life.